There are many kinds of vegan egg dishes, and then there is Okonomiyaki. This difficult to say word is a hybrid of a pancake, pizza, stir fry, and omelette. There really isn't a western equivalent to easily compare it to, but it sure is delicious! Usually it is filled with seafood such as shrimp, squid and bonito fish. These flavours are easy to replicate by using sea vegetables such as wakame (seaweed) komu (kelp) and nori (laver). The strange thing about okonomiyaki's is how much cabbage they contain. Cabbage omelettes are off the radar to many westerners, but you just have to try it to see how amazing it actually is. The cabbage gets crispy and binds the ingredients together, lending some subtle flavour and a fantastic, crunchy texture. And what about toppings? 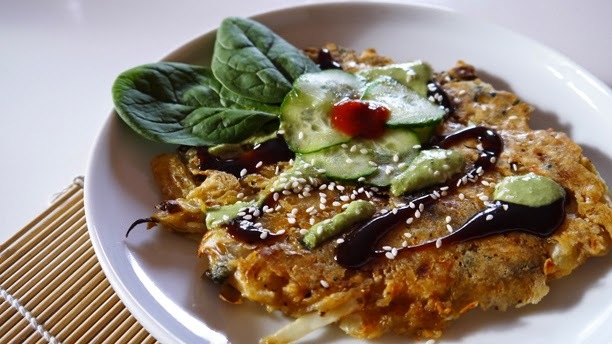 Okonomiyaki is usually topped with a mayo and a brown sauce that tastes like Worcestershire, which both are not vegan, so with that in mind vegan mayo makes an excellent substitute. In a large mixing bowl, combine all ingredients and stir together so you have a thick dough. Reduce flame to medium heat and gently sear each side of the omelette for 2-5 minutes. Store unused sauce in fridge for up to a week.